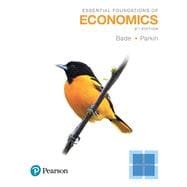 Essential Foundations of Economics , 8th Edition introduces readers to the economic principles they can use to navigate the financial decisions of their futures. Each chapter concentrates on a manageable number of ideas, usually 3 to 4, with each reinforced several times throughout the text. This patient approach helps guide individuals through unfamiliar terrain and focus them on the most important concepts. The text does four core things to help readers grasp and apply economic principles: it motivates with compelling issues and questions, focuses on core ideas, offers concise points, and encourages learning with activities and practice questions. After completing this text, readers will have the foundational knowledge of how the economy works and can apply it to their lives going forward. Robin Bade was an undergraduate at the University of Queensland, Australia, where she earned degrees in mathematics and economics. After a spell teaching high school math and physics, she enrolled in the PhD program at the Australian National University, from which she graduated from in 1970. She has held faculty appointments at the University of Edinburgh in Scotland, at Bond University in Australia, and at the Universities of Manitoba, Toronto, and Western Ontario in Canada. Her research on international capital flows appears in the International Economic Review and the Economic Record. Robin first taught the principles of economics course in 1970 and has taught it (alongside intermediate macroeconomics and international trade and finance) most years since then. She developed many of the ideas found in this text while conducting tutorials with her students at the University of Western Ontario. Michael Parkin studied economics in England and began his university teaching career immediately after graduating with a BA from the University of Leicester. He learned the subject on the job at the University of Essex, England’s most exciting new university of the 1960s, and at the age of 30 became one of the youngest full professors. He is a past president of the Canadian Economics Association and has served on the editorial boards of the American Economic Review and the Journal of Monetary Economics. His research on macroeconomics, monetary economics, and international economics has resulted in more than 160 publications in journals and edited volumes, including the American Economic Review, the Journal of Political Economy, the Review of Economic Studies, the Journal of Monetary Economics, and the Journal of Money, Credit, and Banking. He is author of the best-selling textbook, Economics (Pearson), now in its 12th Edition. Robin and Michael are a wife-and-husband team. Their most notable joint research created the Bade-Parkin Index of central bank independence and spawned a vast amount of research on that topic. They don’t claim credit for the independence of the new European Central Bank, but its constitution and the movement toward greater independence of central banks around the world were aided by their pioneering work. Their joint textbooks include Macroeconomics (Prentice-Hall), Modern Macroeconomics (Pearson Education Canada), and Economics: Canada in the Global Environment, the Canadian adaptation of Parkin, Economics (Addison-Wesley). They are dedicated to the challenge of explaining economics ever more clearly to a growing body of students. Music, the theater, art, walking on the beach, and five grandchildren provide their relaxation and fun.